Xulio Rí­os explains how the passing of the Torch to Beijing for the 2008 Olympics has created enormous tension between China and Taiwan. Not even sports are capable of pacifying the complicated relationship between Beijing and Taipei. 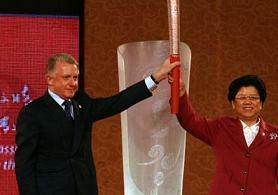 ON APRIL 26th, the Chinese Government announced the official route of the Olympic Torch for the 2008 Beijing Olympics. According to the authorities, the Torch would pass from Vietnam to Taiwan, and would continue on to Hong Kong, Macao, Hainan, Guangdong. For Beijing officials, it was important that the torch pass through Taiwan as a symbol of Chinese ownership of the province. The agreement between the two Olympic Committees was reached on April 18th, after a delegation led by the Vice-President of the Chinese Olympic Committee, Hu Jiayan, met in Taipei with the President of the Taipei Olympic Committee, Tsai Chen-wei. The agreement centered around one major point: if the Olympic torch were going to travel through Taipei, it would have to come from a sovereign state, and then continue on through Hong Kong, Macao. But it now appears that the agreement has fallen apart: the Taiwanese Athletic Authorities are demanding that the torch not only arrive at the island from a sovereign nation, but that it continue on to a third country other than continental China. In this manner, Taiwan hopes to emphasize its status as a sovereign and independent state. The Olympic Torch, a symbol of world unity and cooperation, has transformed itself into an issue of extreme tension between Beijing and Taipei. Many believe that Chen Ming-tong, the current president of the Mainland Affairs Council (MAC) had a hand in breaking the agreement. Chen Ming-tong is very close to Chen Shui-bian and is a promoter of the concept of the Second Republic of the Taiwanese PDP party. It is thought that he may be using the issue of the Torch to influence the upcoming legislative and Presidential elections in Taiwan (to be held in December and March) as well as the outcome of the PDP’s proposed referendum. Hau Lung-bin, mayor of Taipei, gave his approval to the proposed trajectory of the Torch, while other governmental authorities expressed their concern that it minimizes the sovereignty of Taiwan. The KMT, meanwhile, insists that sports be separated from politics, although it does not appear easy. In the ranks of the governing PDP, the ex-Prime Minster Frank Hsieh criticized his successor (and rival in the internal primaries), Su Tseng-chang, for not having assured the participation of Taiwanese athletes in the upcoming Olympic games. Liu Te-hsun, speaker of the Ministry of Continental Affairs, reiterated that Taiwan is an independent athletic entity, and that it should be called Chinese Taipei, as it has been called for years in the few international forums in which it participates, and not Taipei China, as it is referred to in Beijing. Taiwan is a member of the COI and demands the respect of Olympic protocols. According to Liu, there was no agreement to include Taiwan in the route of the Torch, and such an arrangement will only be made if it does not endanger the sovereignty of the island. The controversy began when Lien Chan, honorary President of the KMT, visited the continent and participated in a new Bilateral Forum held by the PCCh and the KMT on April 29th. The forum involved the participation of thirty KMT deputies as well as a large committee of business executives. During the proceedings, the continental authorities announced the new policies to promote bilateral relations, especially in regards to tourism, communication, and transportation, as well as education and youth exchange. After sixty years of confrontation, 2005 marked the beginning of what is known as the third cooperation between the two sides. Lien Chan was received by Hu Jintao for the third time since these talks began. Reaching an agreement will not be easy, especially with the focus of Taiwanese officials on the upcoming elections. The Olympic Torch seems to have provided an opportunity for Taiwanese politicians to distinguish between the collaborationism of the KMT and the resolve of the PDP. We find ourselves, therefore, in the preliminary weeks of a dispute that may last for a long time and produce an uncertain result. Not even sports are capable of pacifying the complicated relationship between Beijing and Taipei. Wow for riots against brutal ‘one-child’ blitz in Bobai! “Many women have been forced to have abortions. Authorities are going into their homes and destroying their homes to implement the policy,” said a woman in Bobai county. Bobai was at the heart of riots that erupted late last week across Guangxi region and saw thousands of people take to the streets in anger against local authorities’ efforts to enforce China’s so-called “one-child policy”. China’s Zheng Xiaoyu sentenced to death – but what about Liu Zhixiang? Zheng Xiaoyu, former director of China’s State Food and Drug Administration (SFDA), was sentenced to death by a Beijing court Tuesday morning. The bribes taken by Zheng, including cash and gifts, were worth more than 6.49 million yuan (about 850,000 U.S. dollars), according to the court. The bribes were given either directly or through his wife and son. The consequences of Zheng’s dereliction of duty have proved extremely serious. Six types of medicine approved by the administration during that period were fake medicines. Some pharmaceutical companies used false documents to apply for approvals, the court said. Zheng ,though,is hapless! If he had flattered Jiang or Hu more, he would die? When Liu Zhixiang (the railway minister Liu Zhijun’s brother) was given a suspended death sentence in April for a long list of crimes that included hiring an assassin, bribery and embezzling some 40 million yuan (5 million U.S. dollars), it sparked indignant letters of protest from ordinary people and legal scholars alike. The railway minister,Liu Zhijun has married five times,yes in self-claimed commie China. His brother is a gangleader who was given a suspended death sentence in April 2006. But he cringes before HU JINTAO,so he is safe. China’s elementary school teachers are paid poorly. The headmasters are kean on cost. elementary school teachers are paid as badly as a unskilled worker!For example,one in Beijing gets a little more than 1000 yuan a month.They have to pluralize and can not concentrate on their pupils. The commie regime of China says that teachers are in the civil servant system.But it is not serious about this.In fact ,the bureaucrats only care about themselves and bribers. All professionals ,including teachers,engineers,accountants etc are all regarded as rebellious.While GDP inflates and inflates,the Chinese Communist Party monopolize moer and more money, the professionals are falling into relative poverty. Whitout indepent trade uions,they can not earn better.